At North Shore Vacuum and Appliance, a local shop now in its eighth decade, we offer expert vacuum repairs Salem MA area residents can trust to last. Are you sick of your vacuum breaking time and again? We offer quality products and skills backed by decades of knowledge that has been passed down from generation to generation. How have we stayed in business so long, you ask? Our customers know they can trust us with selling them quality, top-of-the-line products, and when needed, knowledgeable vacuum repairs. We offer free estimates on vacuum repairs for residential, commercial and industrial clients throughout the greater Salem, MA area. If you have a machine in need of repair, bring it into our shop today to have us take a look. We are open six days a week for your convenience. Or, call ahead at (781) 595-1455 to speak to one of our vacuum repair experts. 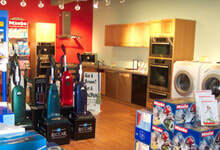 We service virtually all major vacuum brands. So if you have a machine you didn't purchase with us, we will still likely be able to repair it. North Shore Vacuum and Appliance is also a provider for replacement parts, such as hoses and motors and other hard-to-find accessories. So with a majority of what we would need on-hand, you can expect a quick fix from us. For honest service and expert vacuum repairs, Salem MA area residents can rely on us.